There’s nothing quite like the successful student in the successful school to give all the adults associated with them the satisfied glow of a job well done. Follow these simple steps, and you, too, could be bathing in the reflected glory of your progeny. First you must persuade the ten-to-eleven year old child that the end of key stage tests are important, the culmination of everything they have worked towards for the last seven years, and will have long-reaching ramifications on their lives. You can do this by mentioning it at every given opportunity, together with reminders about behaviour and admonitions to work harder*. Next, you must impress upon the teacher the importance of the end of key stage tests by engaging them through the skillful mixing of league tables and performance management. Finally, season with standards (variable) and advice/guidance (to taste) until you have your preferred mixture. Set the temperature to early summer, place all ten-to-eleven year olds in the same room at different tables and make them work in silence all morning and all afternoon. You will know when you have achieved success when the ten-to-eleven year old child has a dead-eyed expression, a sulky mouth, displays no enthusiasm for reading or writing at all, and cries at the mention of fractions. If you are particularly successful, they may even have the slow, tired demeanour of one who is not sleeping due to worry. If your ten-to-eleven year old child is not quite ready for success by the second week in May, you can try holiday and/or Saturday school/catch up sessions. Make sure you do these in advance of Easter for best results. Remember, we all want the best for our children, and nothing quite beats the experience of success. Sam and I watched Prime Ministers Questions yesterday while we were eating our lunch (or rather, I watched it, and Sam tolerated my watching it while he scoffed a hot dog; thankfully, the other two were out, playing with friends, so I was released from the bonds of ‘boring’). I haven’t watched it for a while, and I don’t suppose he ever has, him being at school on Wednesday lunchtimes, and I was curious to see how it would go, all things considered. I find it fascinating, I have to admit. On the one hand, there are the showtime set pieces, where opposing leaders insult and try to catch each other out, and on the other, there are questions about bin collection, dog mess and charity walkers on stilts, in aid of the learning disabled. For a national stage, it is disarmingly parochial. Yesterday, there was quite a lot of shouting (but no paper waving that I noticed, and not much laughter, despite the rather forced comedy of Mr MC Speaker), and Sam waited politely for the applause to stop, and the action, in the form of questions, to start. I have to admit that I never thought that fan-dom of Strictly Come Dancing would mark the beginning of my son’s political education, but there you go. Unlike me, a child of the Spitting Image generation, who bewails the fact that nobody is recognisable any more, thanks to the loss of political satire via the medium of puppets, he recognised a politician thanks to her connection with a different world entirely. Sometimes I wonder what he takes in, when we sit around the tea table, discussing events of the day. A is beginning to join in; his sense of fairness adding to a growing sense of social justice. L rolls her eyes and declares, ‘boring’, although I know, through her concern for her friends, that she is not immune to the concept, either. But Sam; he remains my dark horse, as he keeps his counsel, and concentrates on dinner (or tea). But he reminded me of something important yesterday, as we chuckled together over Yvette Cooper and her smiling, rolling eyes at the nation cheering, spangled antics of her over enthusiastic husband last autumn. He reminded me that I needed to carry on challenging lazy assumptions, because his life, and his future, matters. He reminds me to ask you to ask your local candidates what they will do to support disabled people and whether they have read the UN disability convention. He reminds me to ask you to ask your local candidates what they think of segregation in schools on the grounds of academic ability, and its flip side, inclusion. His presence, and mine, reminds me to ask you to ask your local candidates what they will do to protect our National Health Services – because without a shadow of a doubt, illness or disability, learning or otherwise, can, and will happen to us all. Becuase, in the end, bad things do indeed happen to good people; our frailty is part of who we are as humans. And our descision is how we respond to that. Today, I have very tired legs. I am convinced that this is a genetic flaw on my part, and not because I have been avoiding most forms of exercise for the winter, but my family remains unconvinced. They, unlike me, are tired, but able to tackle the stairs without wincing. And the reason we are tired? 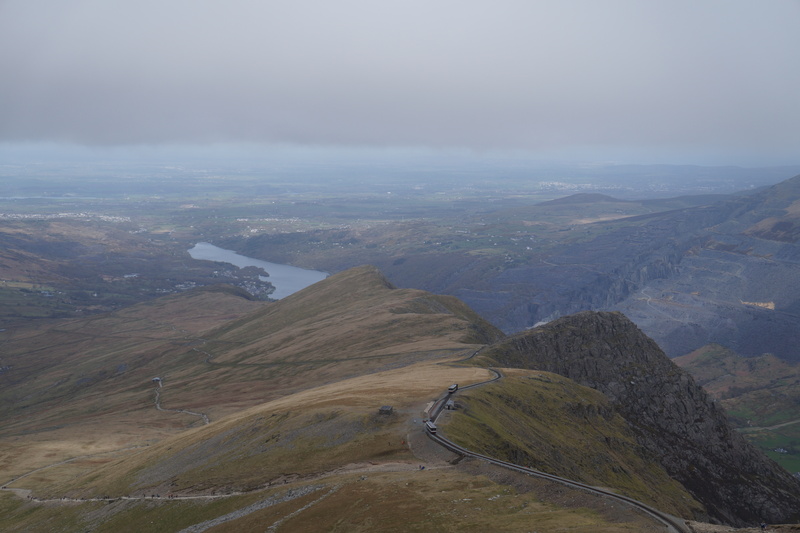 Earlier this week, we decided to walk up and down Snowdon. I’ve written about this plan before. For some strange reason, it has subconsciously been one of those things that R and I felt was something our kids ought to do. I’m not sure why. I never did when I was a child. I never went anywhere near the place. And, when it’s all said and done, we aren’t really a heavily into walking kind of family. Nothing like it, in fact. 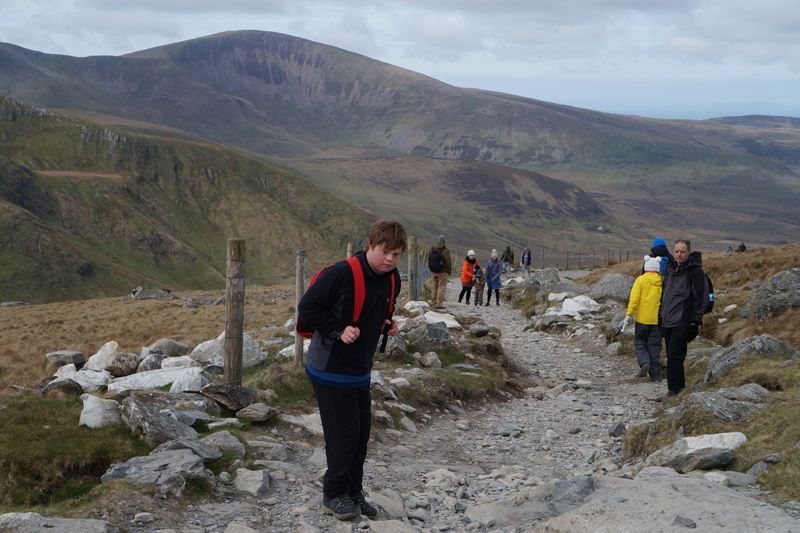 But, we had a week off and nothing on the calendar apart from ‘week off’ in it and, as going on an adventure of the far flung variety proved to be a little more expensive than we had anticipated, Snowdon it was. I don’t know about you, but there is something tantalising about good ideas when they are far, far away. Everything about them seems positive. Nothing troubling can possibly get in their way. Except, that is, until you are faced with the reality of your endeavour. There we were, new boots and posh socks for the children bought, accommodation (very nice) booked, and there I was, wide awake in the darkest hours of the night, unable to sleep for worrying. In a way, it’s a bit like giving birth. After the first time, you sort of forget what it was like. The experience is coloured, airbrushed by the aftermath, whatever form that took. The second baby seems like such a good idea, and it is only when you are stopped in your tracks by the strength of your first real contraction that you think, oh, yes, that was what it was like, and why am I doing this again? After that, it has a tendency not to fade, and, third time round you know exactly what you are doing and you develop a sort of grim-faced determination, gallows humour about coughing in public daytime, and will making in the silent privacy of the night. 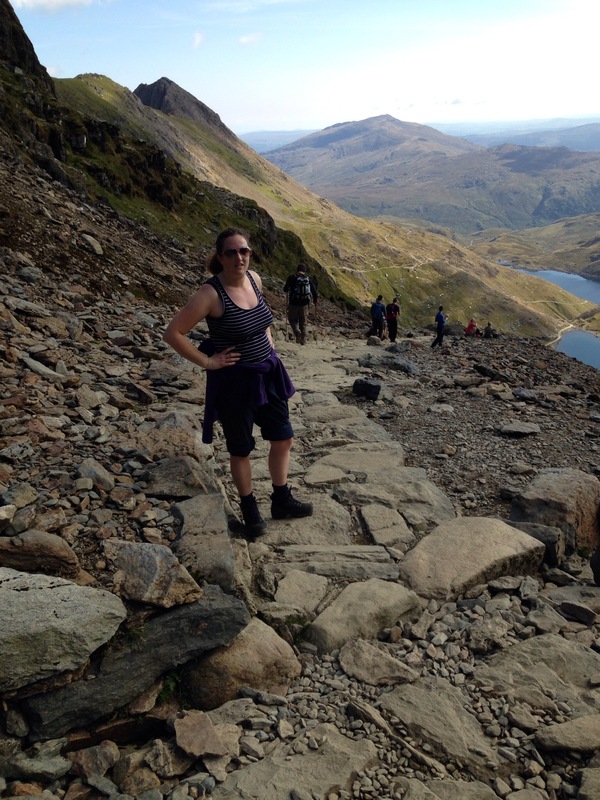 Once I was faced with the reality of getting my three kids up and down a mountain, with online guide rating ‘hard’, the euphoria of success faded and the memories flooded back. When you’re at the top, it can feel terribly lonely – and the way down terribly terrible. The thing about plans, though, is that it is always a good idea to have a contingency one. Because, when you get up to the (nearly) top of the mountain, things change. The weather, so kind and gentle when you set out, is cold and chilling; the wind is fierce, and the clouds, so far away when you are sitting, comfortable, on the bus, transform the landscape from majesty to terror in an instant. We didn’t do it. We didn’t make it to the top. We got to within spitting distance (if the gale that greeted us as we came onto the ridge hadn’t threatened to carry our spit over the cliff and us with it) of the summit and we changed our plan, and our minds. We took in the frightened faces of our travelling companions, looked through the entrance to the Pyg track, obscured by wisps of cloud whipping past and turned right back round the way we had come. And, I think, for perhaps the first time, I feel no sense of disappointment, or of failure, that things did not go as we had thought. The weather did not look like this. You see, and this is something I have found myself thinking Justine Greening could probably do with reading as I have watched her on the news today, you don’t need to terrify everyone or force the issue and put yourselves, and your children, in danger in order to prove a point. When I wrote my book (details on how to buy it here), at the end I put in a section on what to do if it all goes wrong. Because sometimes you find yourself at the mercy of circumstances which you cannot control, sometimes you find yourself in the wrong and you have to apologise – and there is no shame in that. This week, we set ourselves a task, and we failed. But, and here’s the thing: we made it back down in one piece (and that in itself is a success). We went the long way round (and even that had its hair-raising moments), we chatted to the people we found ourselves journeying with and shared encouragement along the way. We might even have done a little bit of Down’s syndrome advocacy while we were at it. We are still here, today, and the mountain, that great big grim-faced mountain we couldn’t even see, will still be there, waiting for us should we decide to play again, tomorrow. It is one of my abiding sadnesses that Sam, through no fault of his own, does not go out to play with friends. At the moment he is, like I was at a similar age, listening to terrible music far too loudly and not feeling the lack. At the beginning of the holidays he is likely to be happy in his own company, mooching around the house, generally doing what he feels like; it is next week that I will find a young person telling me that he is bored, seeking something else to do and the company of his friends. I don’t know if it’s something specific to Down’s syndrome, but I am wary of letting him out to play on his own. I recently had a conversation with the person who is handling his Personal Independence Payments (PIP) – now that he is 16, he is entering into another era of state involvement – and we talked about how, if he was out and about on his own, how easily it could happen that he might get lost, his limited understanding of danger, both in the environment and in terms of the trust he places in other people. Maybe other parents of disabled children feel the same way, I don’t know. I can’t help but feel that he is missing out. When he and his younger siblings were little we used to do that thing that stay-at-home mums do in order to keep themselves from going round the twist, and meet up, as a big group, all together. It was fascinating to watch the children playing. First, they would play side by side, and then slowly, they became more aware of each other, probably because they both wanted to play with the same car/train/dolly/teddy/other object of desire, until before we knew where we were they were playing with each other, chattering away and well on the way to becoming friends. Now, partly because he attends a special school and therefore none of his friends live around the corner, partly because of the advent of the mobile phone (he doesn’t have one and I have no idea how to find out someone’s number unless they give it to you themselves), and partly down to my own sense of caution, I find myself at a bit of a loss as to how to help him gain the invaluable learning experience of unsupervised play with his peers. Because, you know, it would be foolish to assume that there is no value to children’s play; that they should be always organised, never left to get on with it, in their own way and at their own pace. Oh, I’m not saying that it should take place in classrooms – although this doesn’t mean that the classroom should not be a playful place, one full of fun, and the joy of learning interesting things (and yes, I do accept that not every child will find the same thing interesting, although, if I am their teacher, I will do my best to persuade them of the wisdom of my way of thinking) – but that children’s play, especially the unstructured sort where they learn to regulate their own behaviour, to manage their relationships, is an essential, an unmissable, part of growing up. Maybe we are all afraid. Maybe it’s not just me. Maybe the world we live in is full of danger. Of cars. Of strangers. There is the ever present threat of failure, or of falling behind, and it affects us all. Maybe I’ve got a better reason than most to be fearful, but it strikes me, as I watch my children negotiate with each other, as I watch their kindness to the boy next door, as my role as arbiter and sorter out of fights is steadily lessened, that, if we are not careful, our fear will make us into fools.